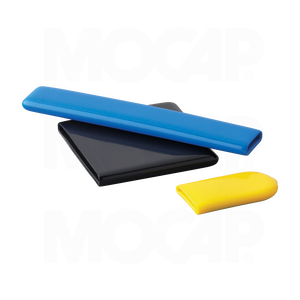 MOCAP offers many sizes of Flat Vinyl Plastic Caps and Grips. Vinyl dip molded flat rectangular cross section caps and grips are durable yet stretch just enough to provide a secure fit on handles, tools, grips and the ends of other items which need protection or appearance finishing. The advantages of the vinyl dip molding process allows MOCAP to offer color, hardness and texture options with no additional tooling charges. Like our round vinyl plastic caps and grips, our flat vinyl plastic caps and grips may be customized using MOCAP's unique printing customization processes which apply permanent, durable imprints. Flat vinyl plastic Caps can be produced in lengths up to 1-1/2". Flat vinyl plastic Grips can be produced in lengths from 1-1/2" up to as long as 8" for some sizes. MOCAP can dip mold flat rectangular vinyl plastic caps or grips in virtually any color or texture to compliment your product as a finishing component visible to end users. You may want to consider other Finish and Appearance Products. Use our flat vinyl plastic caps and grips as durable and inexpensive covers to protect your product during assembly or shipping. Or consider other MOCAP Protective Products. MOCAP's vinyl plastic caps, plugs and grips are often used as inexpensive and disposable single use masking products for painting and coating processes under 300°F (149°C). For higher temperatures, consider our High Temp Vinyl up to 475°F (246°C), EPDM Rubber Masking Products good to 300°F (149°C), or Silicone Rubber Products good to over 600°F (316°C).